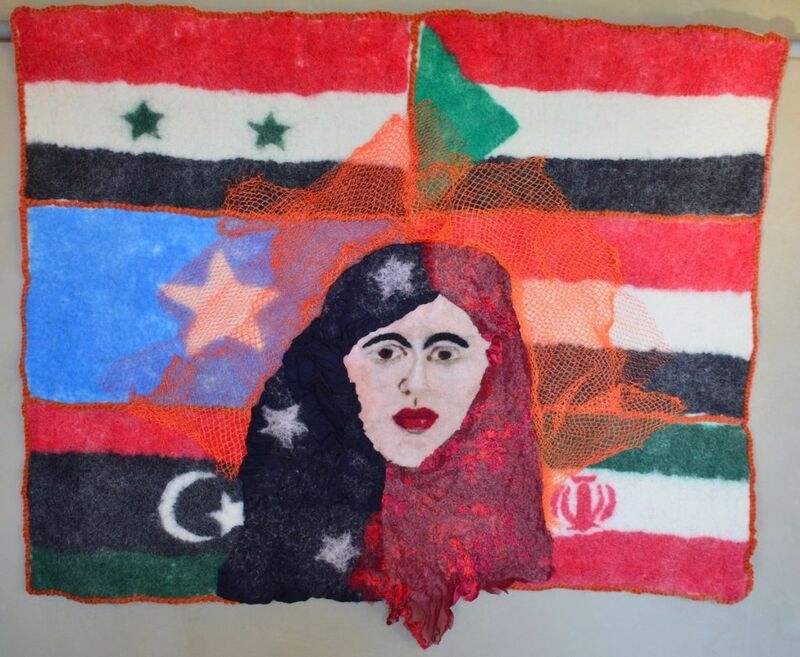 My work references the flags of the Muslim-majority countries (Iran, Libya, Syria, Somalia, Sudan, and Yemen) named in the 2017 executive order targeting refugees, a thinly veiled violation of the U.S. Constitution’s promise of religious freedom. The orange fencing reminds us of the barriers sought by the President. The figure in the foreground, alluding to both the flag of the United States and the current resistance movement is designed to represent the Muslims integrated and welcomed into our society. For this piece it was important to clearly identify the figure as Muslim, realizing that presenting her wearing the hijab fails to capture the diversity of the Muslim community. My goal is simply to illustrate that our Muslim brothers and sisters are both Muslim and American.